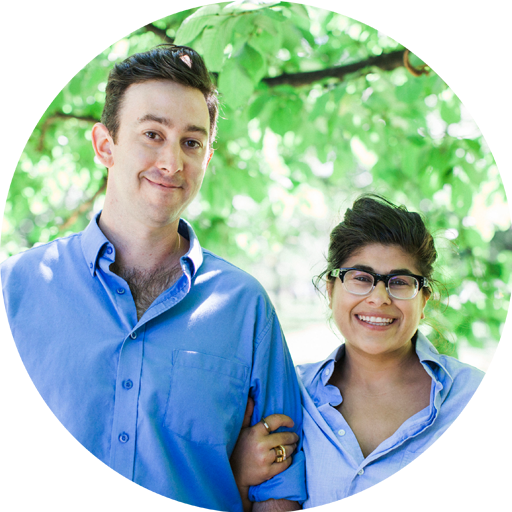 Blisscraft + Brazen is a two-person team; partners in both business + life. Both received BFAs (Baccalaureates of Fine Arts) from Concordia University, Montreal, Canada in 2006. Between the two, they specialized in sculpture, textiles, printing and video. Rachel went on to pursue silversmithing courses at the Montreal Jewellery School while Aaron received his certificate of Cabinetmaking from Rosemont Tech. They each ran separate businesses in sterling silver jewellery and custom furniture making, respectively, for ten years. A lifelong search to live + work in line with their deeply held values led to their move to Silverwood, their one acre slice of Boreal Forest in the Laurentian Mountains of Quebec, and the subsequent birth of B+B. They are relentless creators who strive to create objects that are a) useful b) beautiful and c) ethically made. We believe that, not only can you have beautiful things and homes without adding to landfills and carbon emissions, we believe it is incumbent upon us to consume in a responsible way for the sake of our planet. Our materials are carefully chosen with sustainability in mind. Native hardwoods, abandoned & broken furniture, scrap bits of electrical wiring and scrap leather - all become the raw materials with which we work. We use our combined skill set to make all of our pieces in-house, with the exception of limited edition collaborations that make good use of the incredible range of talent in our peer group. Our wood is all native hardwood or recycled. Adhesives are formaldehyde-free adhesive, textiles are unbleached biodegradable cotton or wool. Our wood finish is a zero-VOC, non-toxic, food safe and earth friendly hard wax oil, certified for use on children's toys in Europe. Metal decorative elements are made with scraps of copper electrical wiring.Wood shavings are used as mulch in our garden, compost and the neighbour's chicken coop. Scraps that are too small to be turned into something useful are used to help heat our studios in the winter. Our shipping materials are 100% post consumer and biodegradable, made in North America. Our gift bags are 100% recycled content. The paper for our thank you notes are made in a small local paper mill. All our printed material is 100% post consumer using vegetable based inks. Silverwood is the acre of boreal forest that we call home. We are surrounded by a mix of deciduous and coniferous trees, clear clean lakes and all the wildlife that makes these mountains their home. An acre of grass is slowly being taken over by fruit trees, veggie gardens, a berry patch and bee-loving flowers. We are currently building an environmentally minded building to house the three different studios in which we work. So far we have spotted deer, foxes, beavers, bears, turtles and a wide variety of squirrels and birds and bugs make themselves at home here. We are grateful to work and live in such an expansive, quiet and peaceful place and believe that our creations carry that feeling everywhere they go.